Fancy your own slice of the Caribbean? 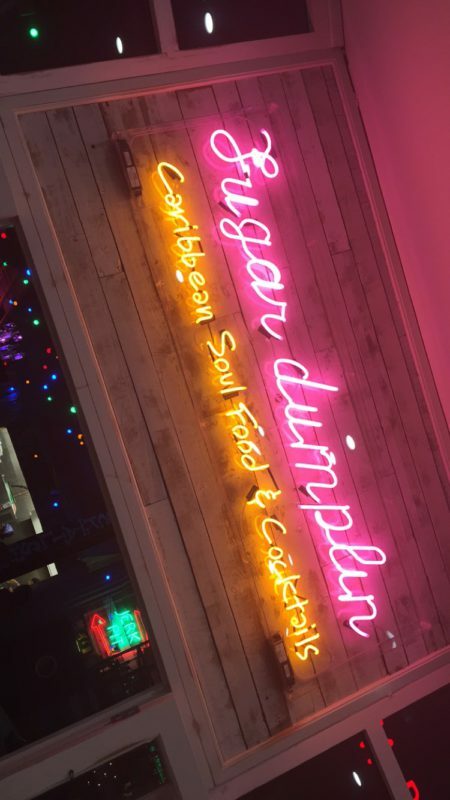 Then Sugar Dumplin’s newest branch offering soul food and copious amounts of rum could be just the joint you’ve been looking for. Tucked neatly inside Kingston-upon-Thames Rotunda complex, you’d find it difficult not to saunter inside with it’s eye catching neon lights, artistic street art and ear grabbing music from outside and within. The insides of Sugar Dumplin were cosy yet spacious with beach like huts in the style of private booths and with steel pan-esque centre bar tables. Decorated with nods to Kingston Jamaica, singing legend Bob Marley, Caribbean delicatessens and bright, bold and summery colours, this felt like we’d landed on the isles of a dream holiday destination. What better way to feel like we’d begun a summer holiday, than to get stuck into the colourful array of rum, vodka and disaronno infused cocktails? Whilst the chefs got down to creating a selection of Sugar Dumplin eats we got started on the cocktails which some of you may be pleased to know come in the shape of a twice a day, 2-4-1 offer (12-7pm and 10pm-midnight.) 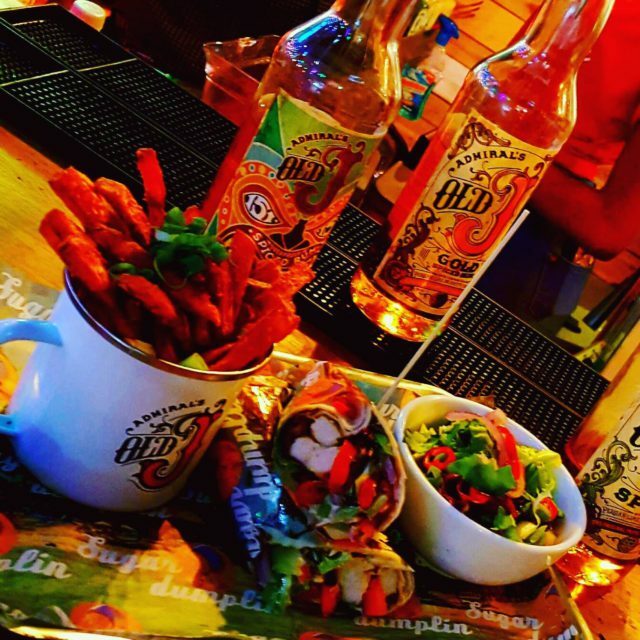 We began with the Bob Marley £9.95- one of the stronger ones as suggested by Sugar Dumplin staff, decorated with Jamaican colours and doused with sweet and fruity mixed rum to make you go crazy. Although a long drink, it didn’t take us long to finish the drinkable treats and we particularly enjoyed the Wray & Nephews filled passionate fruit that had been flamed for added fire. We fitted in another cocktail before our food arrived, the ever popular and creamy Pina Colada £9.95- bursting with pineapple and coconut flavours… also available in a sharing size. The queen of condiments, I was pleased to see a selection of spicy hot sauces and a seriously severe tasting garlic sauce (there was steam escaping from my ears!) We were presented with 3 trays full of tantalisingly tasty food, with dishes that catered for those into spice and those not. My favourite had to be the curry goat; slow cooked and off the bone, mixed with pepper, potato and carrots, this was perfect teamed atop a side of rice and peas, which featured basmati rice, kidney beans, black eyed peas and spices. Although I’m used to eating this curry goat dish with the bones still included, the boneless dish would be perfect for those screamish about eating around bone. A popular dish these days, we couldn’t fault the sweet potato fries topped with nigella seeds and spring onions, matched with jerk chicken thighs and wings under sliced chillies and an optional side of hot sauce. 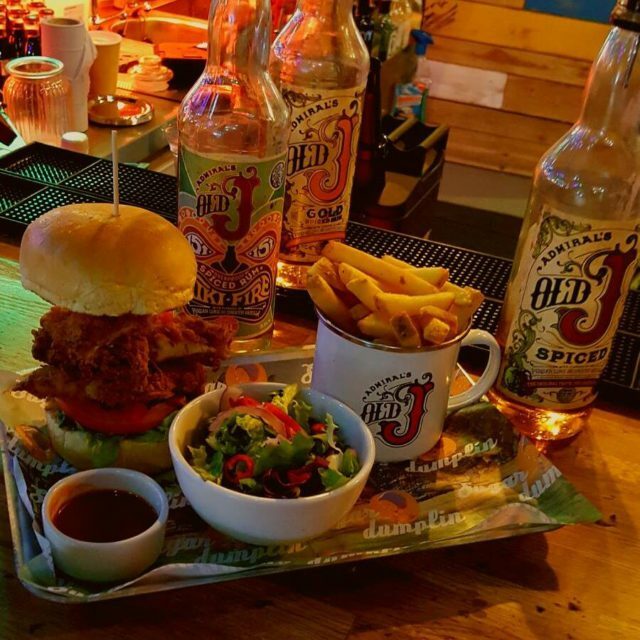 Not one for hot and the super seasoned, then the buttermilk fried chicken (also available in burger form) wrapped inside a salad filled wrap, is just what those spice avoiding fusspots are after. We loved getting to know staff members, some who really shone bright under the lights of Sugar Dumplin. Perfect host Amy, guided us through some more cocktails options- the sweet & sour disaronno Short Skirt, fruity and creamy Bahama Mama and refreshing signature drink being the grapefuit and rum flavoured Wray & Ting. Being almost slap bang in the middle of Kingson town, Sugar Dumplin is the perfect spot to take advantage of and when the mood strikes customers wanting to wined their hips are more than welcome. 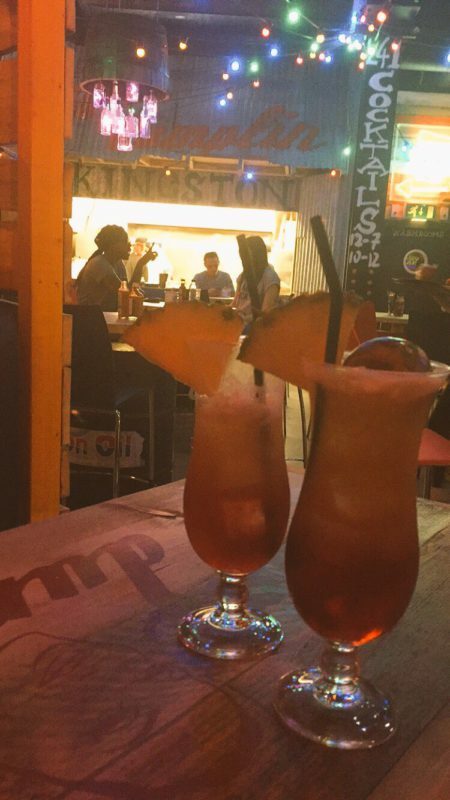 Friday and Saturday evening’s will be made inside Sugar Dumplin, as DJ’s take requests across reggae, ska and soca genres. If you can’t wait until the evening you could head to the food van in front of the Rotunda which will be serving small bowls for less than a fiver… that’s lunchtime sorted. Let’s fast forward back to the main event, we’d sampled an atmosphere that meant we wanted to dance and sing whilst eating and drinking, we were heartedly filled to the brim but we couldn’t resist dessert, consisting of a drenched rum cake. Almost packing a punch more than the tropical cocktails, with lashings of white, dark and spiced rum (perfect for rum lovers and full time pirates,) we wondered how we could top the experience. Although we were sad not to spot good old fashioned mac & cheese on the menu, we are looking forward to trying more from this ever expanding chain, such as the veggie butternut squash and chickpea creole, saltfish patties, sweet dumplins, red slaw and plantain chips. 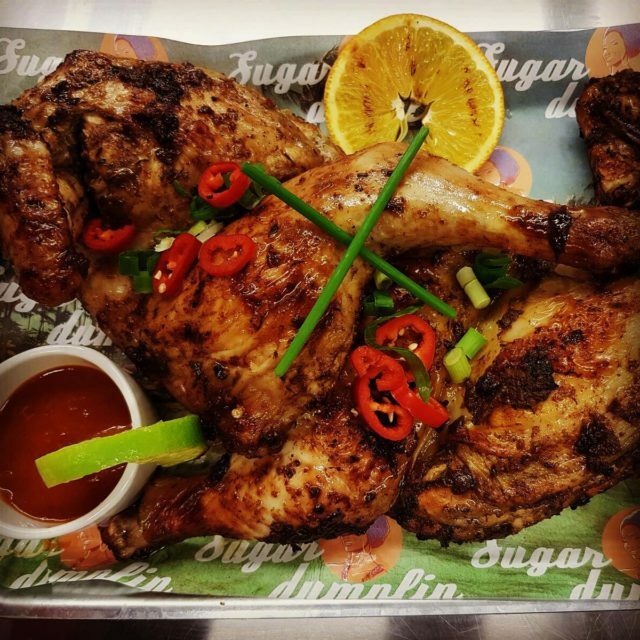 So if you’ve always wanted to sample Caribbean food but you’ve been too scared, then Sugar Dumplin is the perfect introduction… let Sugar Dumplin do all the hard work for you and after you’ve come in for food, you’ll find yourself sticking around for the vast collection of tropically smooth cocktails.